W ith the Thanksgiving turkey and all the trimmings now firmly behind us, it’s time to look forward to the next big holiday observance. 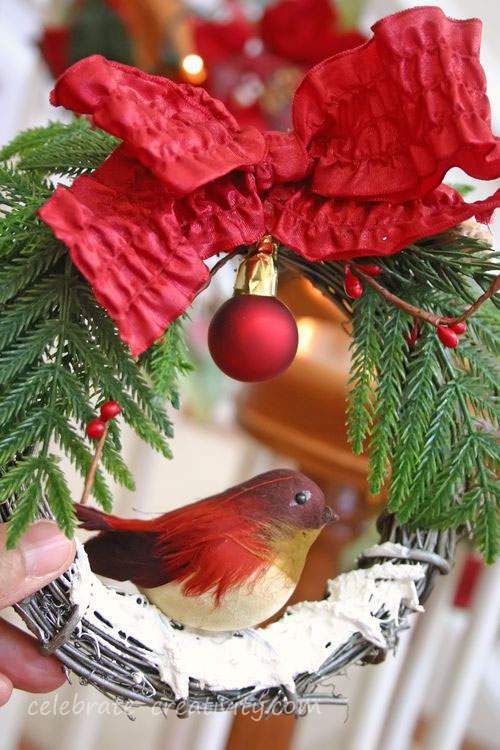 I’m just starting to drag out and dust off my holiday decor and this simple wreath was the first thing I unwrapped. I have the wreath hanging on the inside of my front door and this year I decided to add a little more to the door after finding a few extra jingle bells in my tree ornament pile. 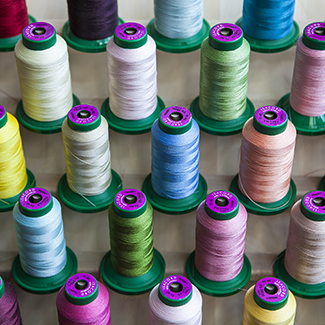 This is an easy project and you’ll only need a few supplies which you may already have on hand. Grab your hot glue gun, a little bit of holiday ribbon, some jute (my favorite all around burlap string) and a few pine twigs. You’ll also need a metal ring which you can pick up for under one dollar at jsut about any hardware store. Start by wrapping the jute around the metal ring once and then tie a slip knot to hold it in place. Continue wrapping the ring all the way around the metal ring. 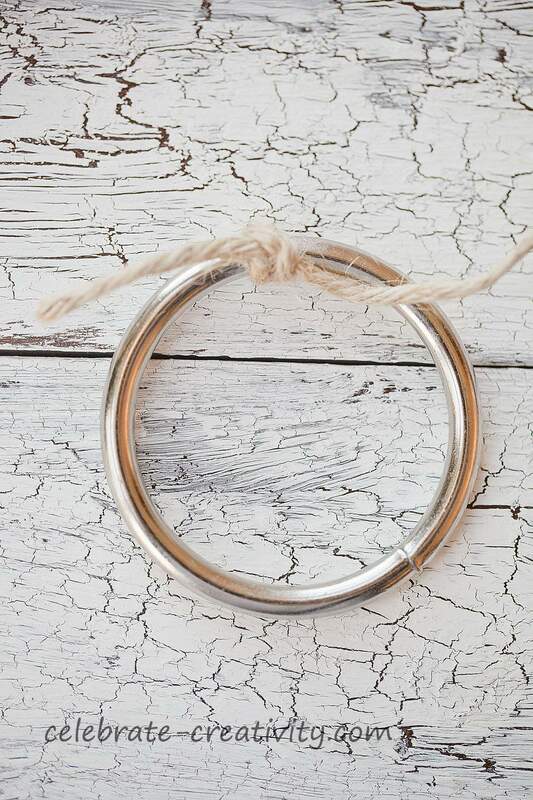 Make sure you pull the jute tightly around the ring as you’re wrapping for maximum coverage so that no metal is visible. 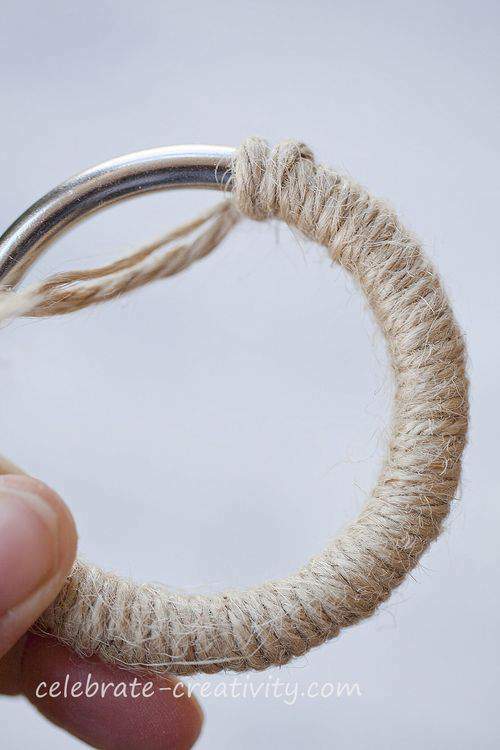 Once the ring is covered, pull the loose end tightly and tie in knot. 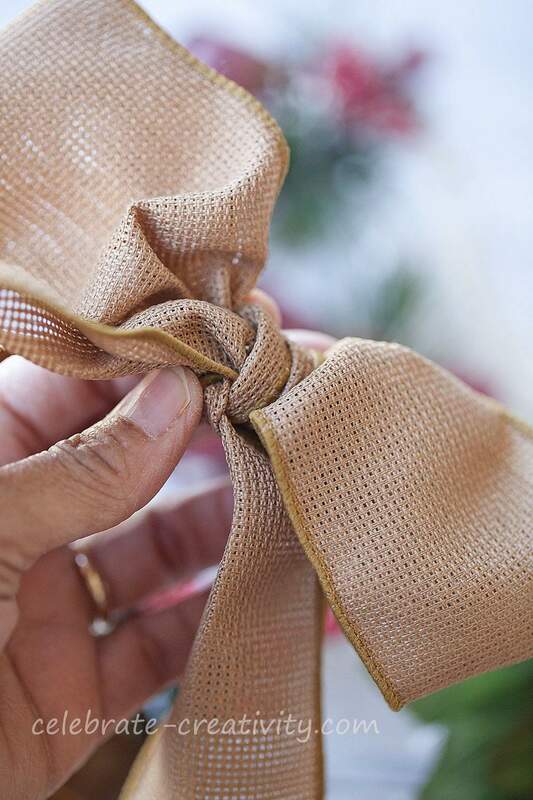 Add a dab of hot glue to the knot to hold in place. 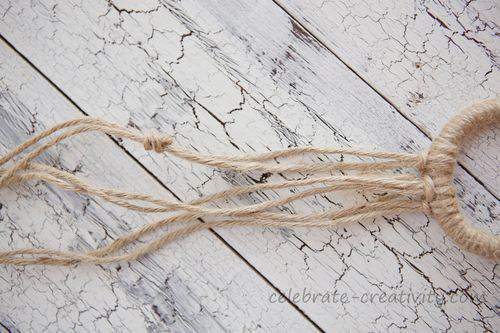 Cut three pieces of jute about 1-1/2 feet long. 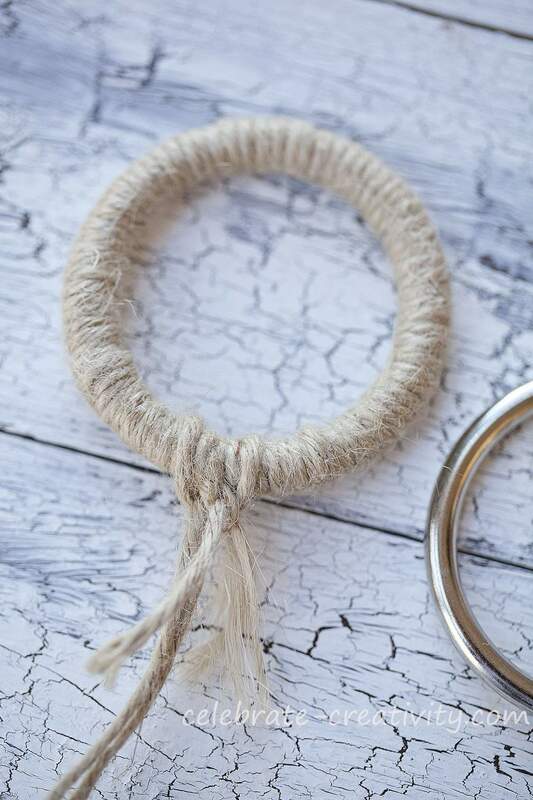 Fold in half and single-loop the jute around the bottom of the ring where you glued the knot. Tie a knot on the bottom of each strand of jute at three different tiered spots. These knots should be positioned like stairsteps, one right after the other about an inch or so apart. 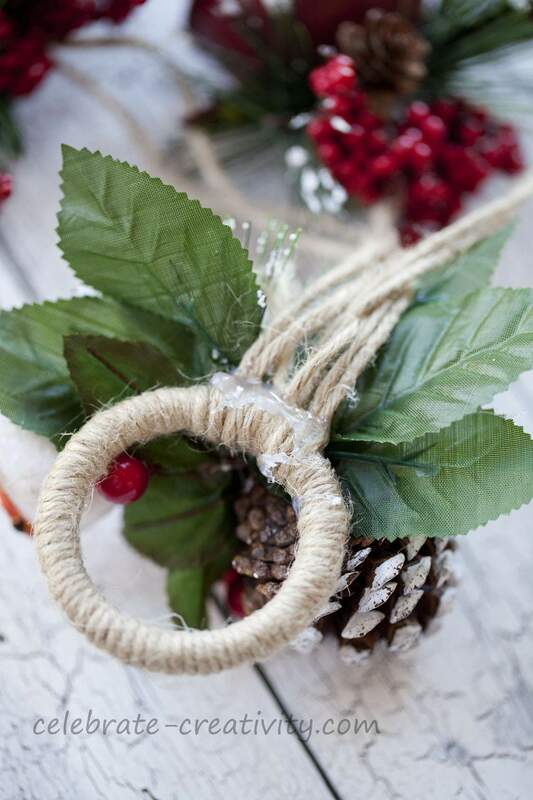 Trim excess jute just below the knot and apply hot glue to the entire knot. 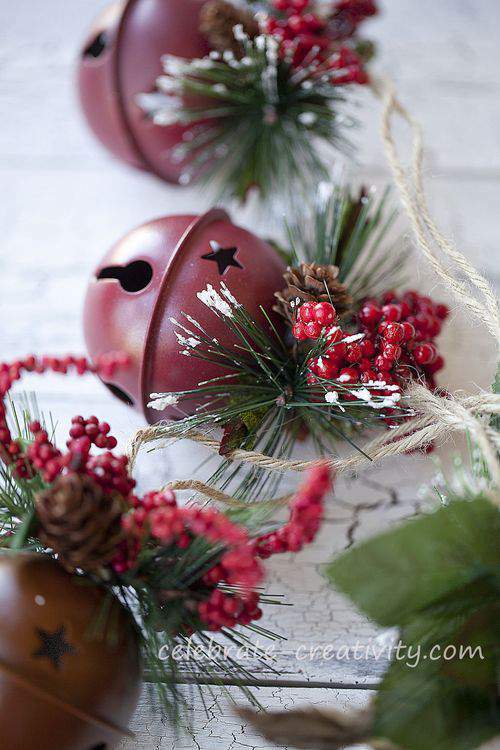 Then, tuck the glue-covered knot down into the jingle bell ornament and hold in place until dry. 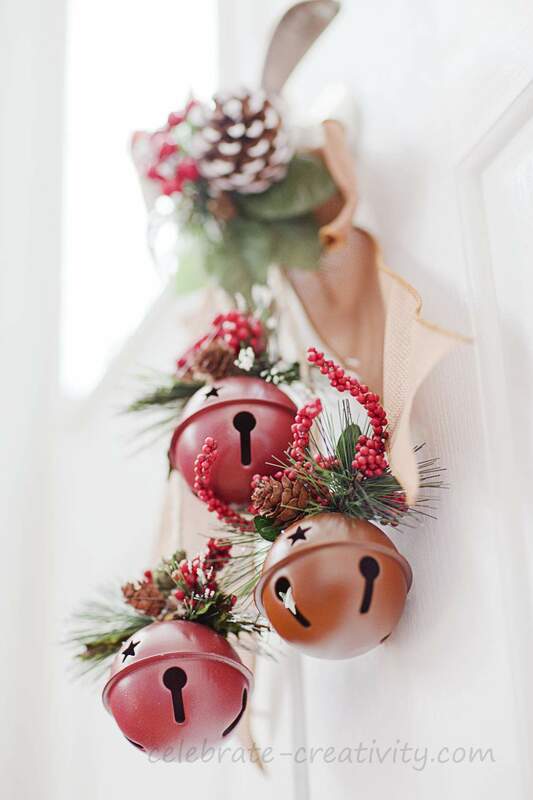 Repeat this step with each of the three jingle bell ornaments. 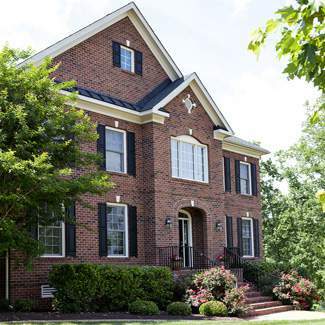 Once each knot is firmly in place, you may need to slightly reposition the decorative pine to conceal the attachment. With the jingle bells in place, you can now turn your attention to decorating the top portion of the ring. 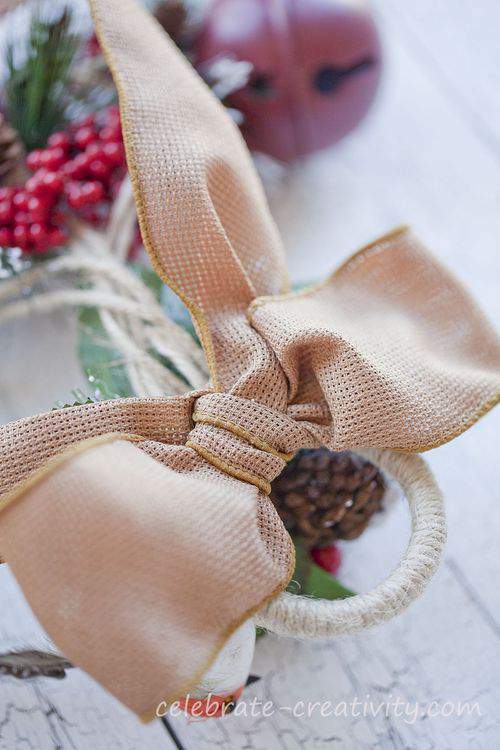 Create a small bow with the holiday ribbon and set aside. Hot glue a small twig of holly to the bottom part of the ring and allow to dry. Flip the ring over and apply a small amount of glue to adhere the ribbon. Hold the ribbon firmly in place over the hot glue until dry. Remember, the ribbon is glue to the back of the ring. With that, you’re done and you’ll have a pretty, handcrafted door hanger. Now, my interior door wreath has a bit of company for the holiday season. 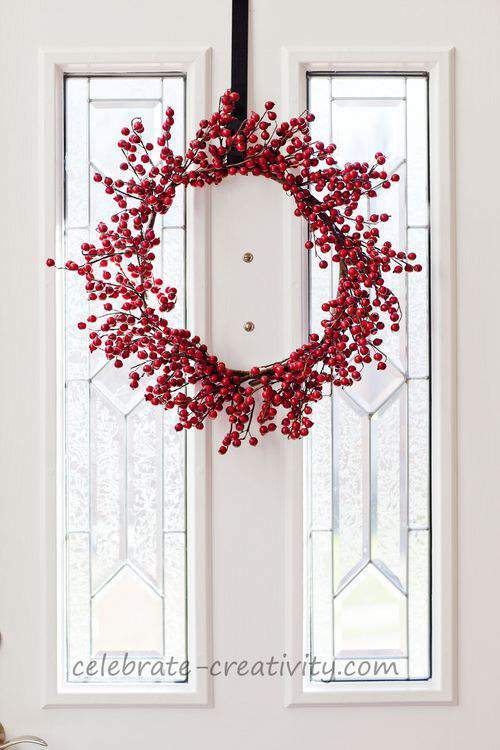 I love the sound of jingle bells when this door opens and closes. While, I like my jingle bell door hanger on my front door, you could make one for just about any door in your home to add a little color and festive spirit. This is the kind of project in which any kind of holiday ornament could be used, not just jingle bells. I’m participating in a number of Linky Parties around the web so stop by the following links to see what other bloggers are creating for the holidays. 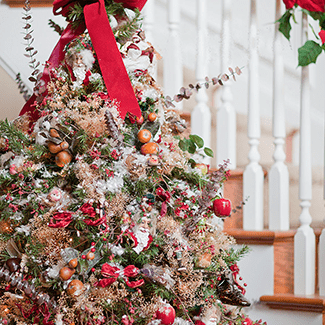 Check out Beth’s party over at Home Stories A to Z for tons of holiday spirit and projects. 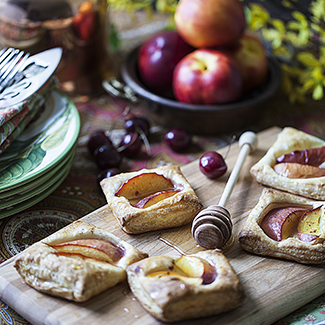 Head to Marianne’s soiree over at Songbird for beautiful ideas that will really get those creative juices flowing. 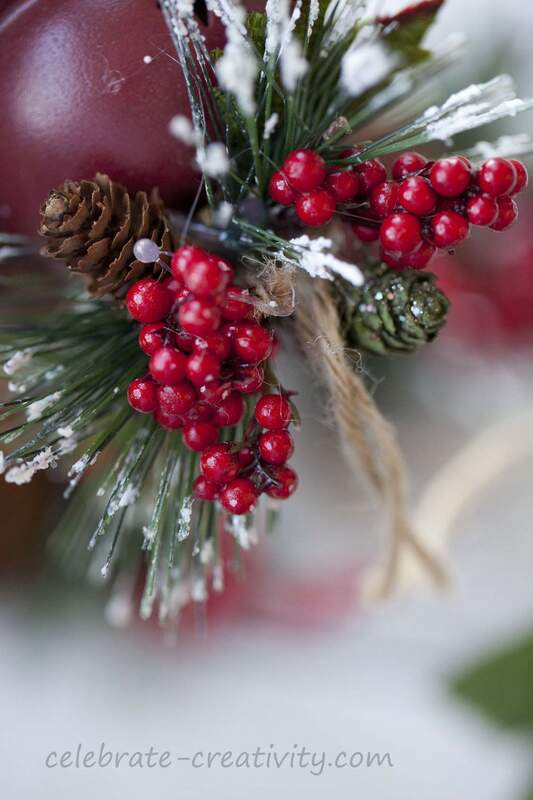 Also, check out the seasonal inspiration over at Angela’s at Cottage Magpie for more holiday fun and crafty eye candy. Also, you’ll love the ideas over at Linda’s Linky Party at Coastal Charm. Head over to Shanty 2 Chic where Whitney and Ashley are hosting tons of creativity on their linky party. 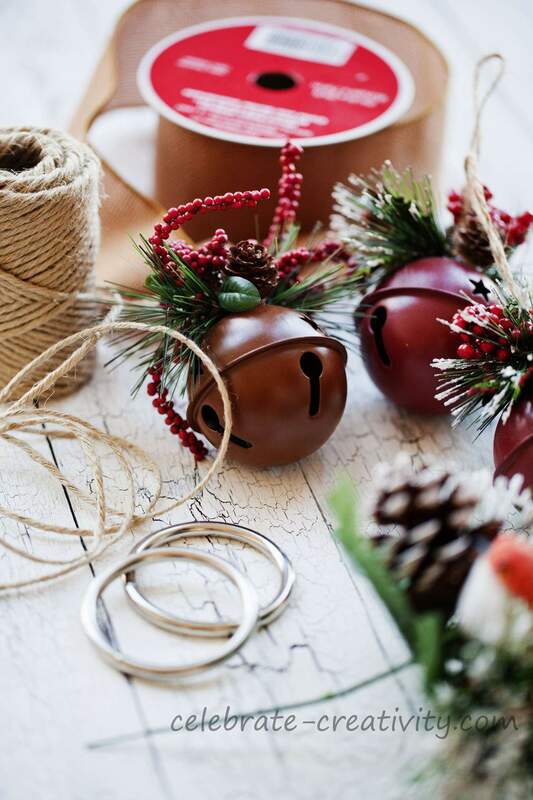 Michael over at Inspired by Charm is hosting a fab holiday linky party too filled with ideas you’ll want to try yourself. 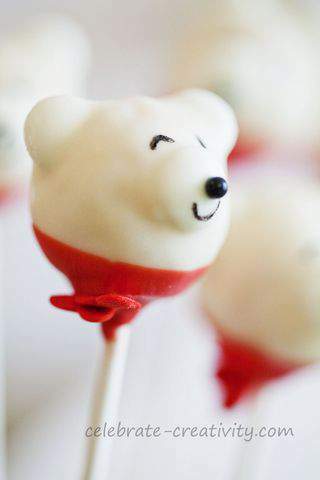 If you’re a cake pop fan (like me), you’re going to love these scarf-adorned Polar bears. Actually, I’m fairly new to making cake pops but once you start making them, it’s pretty hard to stop. Coming up on Friday, I’m kicking into high gear for the holiday season with a closer look at how to make these totally adorable sweet treats on a stick. Hope you pop by this blog again later this week for THE FRIDAY FOODIE and a trip on board the Polar (Bear) Express. OMG! Jingle bells on a door seriously warms my heart. This is fantastic!! Thank you so much for linking up to the 12 Days of Christmas Link Party via Inspired by Charm! Darling project 😉 So nice to meet you Lisa! 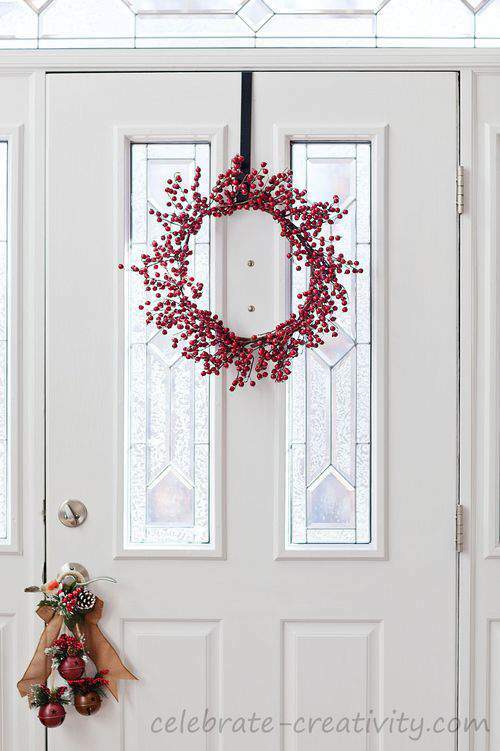 I love your door hanger, and the wreath above it. It looks so lovely and traditional, it has Christmas written all over it. Thanks for showing s how to do this. Great decorations!! Gets me in the mood for Christmas crafting. 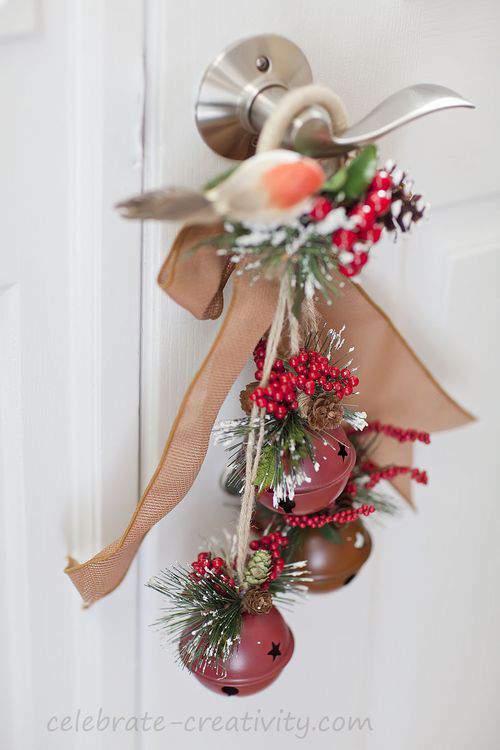 This door hanger is absolutely adorable…and I do think I have everything in my house to make this! Great idea…but you have wonderful ideas all thru the year. Hermoso Proyecto. Me encanto, Lo voy hacer.